Announcement StrawberryCouture is about creative and unique womens crochet and knit hats scarves patterns and having fun with a crochet hook and knitting needles. My hats are a combination of millinery couture and practical crochet. They are made with high quality precision. Each one is carefully hand crafted. Original designs by Lenore Berry-Zaragosa. Hello and a great big thank you for inviting me into your screen! Please allow me tell you a bit about myself. Everyday I motivate myself to think and create new things. My twisted designs set me apart from the rest. It so happened to be hats. My style is starting my designs with a twist. In the next few months I would like to create other accessories besides hats and scarves. How often do you wear a hat? These unique hats are practical and artistic. I've been selling on Etsy since 2006 with great customer satisfaction. StrawberryCouture is about having fun with a crochet hook and knitting needles. This is your source for unique handmade crochet and knit hats, and scarves for women. Items in my shop are color coordinated. Look for your favorite color. Physical items have a turnaround time of 3-5 business days. StrawberryCouture is about creative and unique womens crochet and knit hats scarves patterns and having fun with a crochet hook and knitting needles. Another really cool hat!! It did indeed arrive on time, and looks exactly like the picture. It is extremely unique, and the color combination is beautiful! I ordered another hat at the same time, and received them together in about two weeks time (which in itself is amazing!!) As in the case of the other hat, the skill and workmanship are phenomenal!! Super purchase!! Oh my gosh - this hat is gorgeous!!! I got it in denim blue, and it is fantastic! So unusual, and it looks exactly like the picture. I did absolutely receive it on time, and although I can't wait to wear it, I feel a little intimidated about doing so! It is made of acrylic yarn, but is very substantial (so I'd better get some wearing in before summer arrives full force.) I have locks and purchased an extra large, so it is a perfect fit. This hat is truly unique, and the workmanship and skill that went into it is astoundingly evident! It is well worth the price, and I love it!! I was born to stand out, twist, and Shout! Louise Couture - My late grandmother inspired me to crochet. 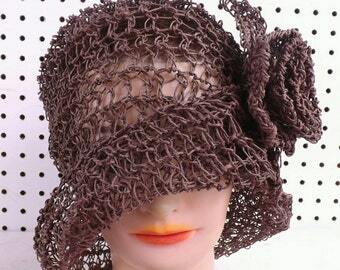 I am crocheting a hat to order. I am like nothing else in the world. I'm full of imagination and education. I get excited over new thoughts and want to understand them. I like learning new things and making reason of them. Before strawberrycouture, our life story began when my husband and I met in the Army. I served 5 years as an Army cook. I served one overseas hardship tour in Korea and worked 14 hour workdays 12 days straight. Fernando aka Freddy, my hero husband served 15 years as an Army support truck driver. He delivered supplies to war zones. He served in 2 wars: Operation Desert Storm and Operation Restore Hope in Somalia. The movie Black Hawk Down recreates this. He served in the 10 Mountain Division. Today we stay at home while I maintain this business. We get a kick out of the chance to do simple things together. I stay at home with my husband, and I mean hero in all sense of the word. He suffers from PTSD (Post Traumatic Stress Disorder). PTSD, a severe anxiety disorder, develops after exposure to any event that results in psychological trauma. This is common to combat veterans. He served 2 combat tours of Desert Storm and Somalia. He cannot be alone for more than a long period. Thus the VA (Department of Veteran's Affairs) recommended he stay at home. I encourage individuals to consider unheard of options as I do. I need individuals to see the world and think as I do. Magnificence exists to making your own particular form of a typical thing. My hats and scarves have a gigantic impact from numerical shapes. I need to do what nobody else has done. I need to crochet and knit everything from a basic ruffle infinity scarf to hat designs. I do everything myself. I take orders, work the PC, outline the designs, crochet them, and ship them. My better half Fernando drives me to the post office so I can send my requests. Regardless of what time, he takes me there. I show him the PC every so often. I work alone and I appreciate making companions all around the globe. Scroll down in the article. I am pleased to announce that Kathryn from Crochet Concupiscence featured my shop in her blog - http://www.crochetconcupiscence.com/2013/01/interview-with-innovative-crochet-designer-strawberrycouture/ Find out what questions she asked me. Welcome to my crochet studio. This is where I make all my handmade orders from you. My husband and I live in a one bedroom apartment. I crochet next to the daylight and have natural lights where I can see all my yarn and colors accurately. I am a five year Army veteran cook. I do almost everything in this shop. I learned to crochet when I was little. My grandmother crocheted night and day and always had to make something after learning who was getting married or having a baby. It's not about the hat. It's about the shape that evolves into a hat. Hello and welcome to Strawberry Couture on Etsy. 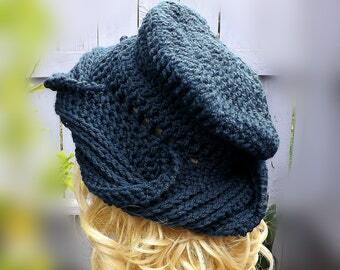 Experience a whole new way of crochet hats, scarves, and crochet patterns. Customer satisfaction means a lot to me. When you buy custom-made, you get what you want from the manufacturer. There is no middleman. Thanks for checking out my Strawberry Couture shop. Follow me for my updates on Etsy. Visit my profile. Below my name Lenore Berry-Zaragosa is on the upper left side of the screen. click the blue button to follow. Advanced users may copy and paste my RSS feed. https://www.etsy.com/shop/strawberrycouture/rss into your favorite RSS reader. If you like a listing, tweet it on Twitter, pin it on Pinterest, or like it on Facebook. MONEY BACK OR EXCHANGE GUARANTEE. If there is a shopping error such as buying the wrong physical item, I will issue a refund. If you are not happy with your order, send it back at your own expense within ONE WEEK of receiving it in the mail. EU customers only is TWO WEEKS. Shipping it back with insurance is optional. I will not issue refund until I receive the item back in its original condition. I welcome exchanges for the same value of the original item (bought something for money). HOW YOU WILL RECEIVE REFUND. Buyer will receive an email whether you paid with Paypal or Direct checkout. IF YOU PAID WITH PAYPAL, the refund will post immediately to your account. IF YOU PAID WITH DIRECT CHECKOUT, Etsy will acknowledge the refund. But it will not reach your bank until 3-5 business days later. ALL SALES ARE FINAL for downloadable or emailed patterns. EXCEPT if customer buys a duplicate pattern/s. I will refund or exchange for it/them. Buyer will receive refund for the item only after return shipment. THANK YOU for prompt payment immediately for your purchase or order!" You may now checkout from more than one shop at the same time. "I accept all major credit cards through my Paypal account. You do NOT have to have a Paypal account to purchase." strawc will appear on your credit card statement if paid through Paypal. TEXAS subjects its residents to 8.25% sales tax. Please read the processing time for each shop listing. How To Cancel an Order: Read helpful article - http://www.etsy.com/help/article/1945 Please contact me. Attention buyers living in the European Union. Buyers must pay VAT for digital downloads. But NOT if I manually email it/them. I use USPS to ship every package. Every package including single or multiple items are insured. This includes within and outside the United States. Shipping cost depends on the weight on select items. Shipping upgrades are available too. USA CUSTOMERS – Single items ship first class mail 3-5 days. More than one item ships priority mail 2-3 days. I insure every package. You will receive an email confirmation that your order shipped with a tracking number. Free shipping is for instant download patterns. You will receive an email and notification that your pattern is ready to download. Customers located within the state of Texas will include an added sales tax of 8.25%. International customers outside the United States are responsible for all fees connected with shipping. This includes physical and downloadable digital items such as PDF patterns. EU(European Union) customers only must pay VAT(Value Added Tax) at checkout. PACKAGES WILL SHIP AS MERCHANDISE. Packages with single or many items ship first class mail international 2-4 weeks. This depends on its residents import taxes, customs duties, and fees charged and collected by the destination country for orders. I insure every international package regardless of value. You will receive an email confirmation that your order has shipped with a customs number. The recipient must bear extra charges for customs clearance. I have no control over these charges and cannot predict them. They vary from country to country. You should contact your local customs office for further information. When rules need customs clearance, they can cause delays beyond my original delivery estimates. All international orders have full value declared on customs forms - no exceptions. Packages can take up to 4-8 weeks...I will issue no refunds if its takes more time. LOST PACKAGES/INTERNATIONAL BUYERS. First contact your local post office otherwise contact your local customs office. FILE AN INSURANCE CLAIM - Recipient must wait 45 days after filing a claim from seller and buyer. Recipient needs to fill out an online form if the package values under $100. Otherwise recipient needs to fill out a physical form if it values over $100. I will then replace/refund once claim is complete. If you have any questions about something you don't understand, please ask me. I rarely do trades on Etsy because I sell my handmade items for the income it brings. Don't take it personally if I decline your offer. If pictures appear darker, please adjust your computer's brightness and contrast. To fulfill your order, you must provide me with certain information (which you authorized Etsy to provide to me), such as your NAME, EMAIL ADDRESS, POSTAL ADDRESS, PAYMENT INFORMATION, and the DETAILS OF THE PRODUCT THAT YOU'RE ORDERING. You may also choose to provide me with additional personal information (for a custom order of jewelry, for example), if you contact me directly. For purposes of EU data protection law, I, Lenore Elise Berry-Zaragosa, am the data controller of your personal information. If you have any questions or concerns, you may contact me in a convo on Etsy, or at fred_len1 [!at] yahoo.com, or write to me at 6162 Misty Meadow Rd Apt 1107, Corpus Christi, Texas, United States. What Is The Turnaround Time for Each Item? Physical items have a turnaround time of 3-5 business days unless in the title states Ready To Ship. Sizing Details - How Do I Measure My Head? Place a string or tape measure around your head about 1/8" above your ear, across the mid-forehead, completely circling your head. Hold the tape firmly, but not too tightly. Basically you need to measure your head exactly where the hat will sit. If your measurement falls between sizes, choose the next largest size. If are still not sure of your head circumference size, the average size of a women's head is 22 1/2. If your size is not listed, please contact me with your custom measurement. What Are the Care Instructions for Each Item? Items made of 100% acrylic yarn. Machine wash warm. Air dry flat. Items made of 100% cotton yarn. Machine wash warm. Air dry flat. Did I Design Everything In My Shop? YES YES YES I did and I'm proud to say it! My hats and scarves are inspired by the mobius infinity twist. My style goes against the grain but works seamlessly. My designs are inspired everywhere I go. I combine and design my love of details. There are generally no limits for when or how many times you can download a file. In most cases you can access a file any time on your Purchases page, provided the transaction hasn't been canceled or removed. What If I Need Help Understanding A PDF Pattern? abbreviations used, any special stitches used. I offer free assistance with every pattern. Send me an email or contact me via Etsy. Every pattern has written instructions with helpful pictures. Certain ones have a link to a video clip. At the end of checkout, however, is a link of helpful video tips and tricks on Youtube. Apply these to your crocheting and knitting experience. How Do I Download My PDF Pattern/s? After purchasing a digital file or PDF pattern, you’ll see a View your files link which goes to the 5 page. Here, you can download all the files associated with your order. What Kind of Yarn Should I Use for the Crochet and/or Knit Patterns? How Much of it Should I Use? I use worsted weight weight yarn. Here are some recommendations. 1 skein I Love This Yarn solids worsted weight 100% acrylic. 355 yards(325 meters). Available at Hobby Lobby craft stores. 2 skeins. I Love This Yarn stripe, sparkle, and ombre worsted weight 100% acrylic. 252 yards(230meters) each skein. Available at Hobby Lobby. 2 skeins. I Love This Cotton solids medium weight 100% cotton. 180 yards(166 meters). 1 skein. Caron Simply Soft solids worsted weight 100% acrylic 315 yards(288 meters). 1 skein Red Heart Yarn worsted weight 100% acrylic 364 yards(333 meters). Buy Your Item Today! How to Buy on Etsy. Is My Payment Secure? Ordering is easy. Just click the add to cart button on the right and bu with a credit card or PayPal. I’ll have your order on the way within the processing time. Your payment is secure. All credit card information sent to Etsy is encrypted using secure socket layer technology (SSL) and stored in a PCI compliant environment. When you pay using your credit card on Etsy, we do not send any of your credit card information to the seller. The seller does not have access to your credit card information. What Shipping Service Do You Use? Explain How and When Do I Receive My Order? Customers located within the state of Texas will include an added sales tax of 8.25%. Packages with single or many items ship first class mail international 2-4 weeks. No. Sending packages marked as a gift is illegal. They will be marked as MERCHANDISE. You are responsible for any VAT fees in EU countries. They are out of my control. I found an online VAT calculator for for EU buyers. http://www.dutycalculator.com This includes any fees in all other countries too. How Much Hemp Twine Should I Use for Patterns that Call for it? Hemp Twine Ball, 400 ft(122 meters) Length. Width is 1mm. Measures 2.75 x 3.0 x 2.75 inches. Available at your local Walmart store. Located in the jewelry crafts section in earth tone(natural) and brown.